Read Schedule A and confirm that all information is accurate including spelling and name abbreviations. The names should reflect the buyer’s legal name. Review Schedule B carefully as the items in this section can affect property use and access. Title objections must be submitted in writing according to the provisions of the contract. 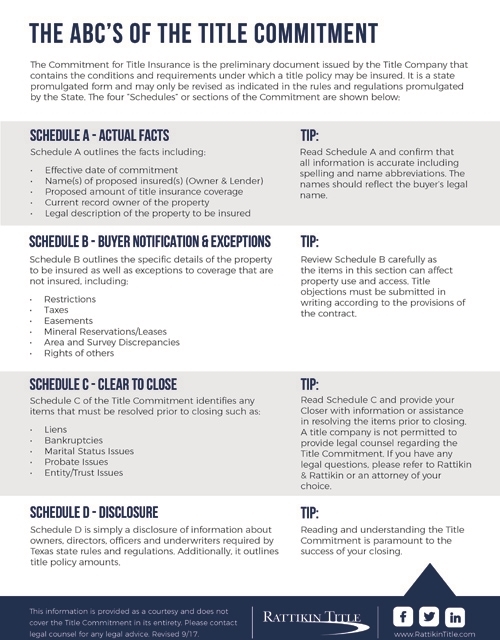 Read Schedule C and provide your Closer with information or assistance in resolving the items prior to closing. A title company is not permitted to provide legal counsel regarding the Title Commitment. If you have any legal questions, please refer to Rattikin & Rattikin or an attorney of your choice. Schedule D is simply a disclosure of information about owners, directors, officers and underwriters required by Texas state rules and regulations. Additionally, it outlines title policy amounts. Reading and understanding the Title Commitment is paramount to the success of your closing. This information is provided as a courtesy and does not cover the Title Commitment in its entirety. Please contact legal counsel for any legal advice. Revised 9/17.